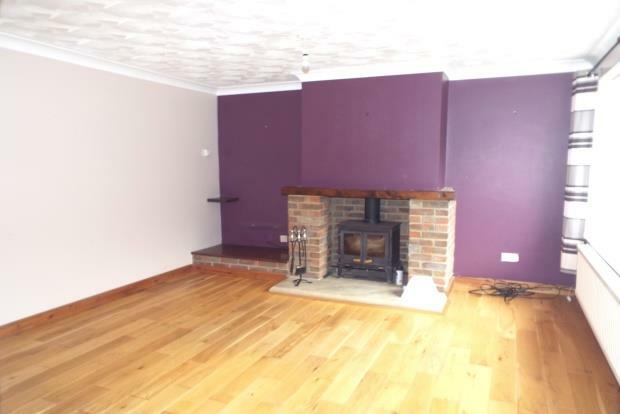 3 Bedroom House To Rent in Canterbury for £850 per Calendar Month. Spacious three bedroom family home in quiet cul-de-sac with kitchen/breakfast room. Off road parking and garage. Available NOW. Spacious hallway leading to all rooms, the lounge is a good size room with views to the front of the property and has a pretty feature fireplace. The kitchen/breakfast room has patio doors out to the rear garden. There is a good range of wall and base units with space for a washing machine. There is a free standing electric cooker with electric oven. Upstairs there are 2 double bedrooms and a further good size single bedroom. Family bathroom comprising of bath, WC and wash hand basin. Outside there is a low maintenance garden completely paved with two storage units, there is a garage and ample parking for residents. Available now, sorry no DSS or smokers.